Americans will go to the polls next Tuesday to vote for what could be, based on approval ratings, the two worst candidates in U.S. history. To salute the really bad and take your minds off of all of the political talk, we've decided to go back and look at some of the worst records to ever make the top of the Billboard Hot 100. Each day, through next Tuesday, we will highlight another of these rare gems. Today, we go back to October 1976 and the only hit by now nationally known disc jockey Rick Dees. At the time, Dees was a DJ at WMPS in Memphis, TN. Rick says he wrote the song in just one day, taking inspiration from the 1965 hit The Duck by Jackie Lee who was, actually, Earl Nelson from Bob & Earl. Dees said it then took three months to find someone who would actually produce and perform on the record. Dees took on the lead singing duties and his friend Ken Pruitt provided the Donald Duckesque quacking and voice. Once it was released, Dees was forbidden from playing it on his own show and no other station in Memphis would air as they felt it would promote Dees' station. One day, Rick just talked about the record on the show and he was fired by management. It didn't make any difference. 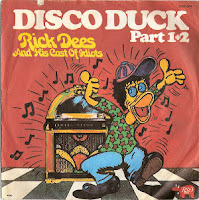 It gave Dees time to promote the record and he soon not only found himself with a new job at another Memphis radio station, but also a major hit record as Disco Duck went to number 1 on the Billboard Hot 100 for one week but then stuck at number 2 for four more weeks. When all was said and done, Dees had a platinum record, the track went top ten in almost every country in the world and we had one of the worst number 1 records of the rock era.